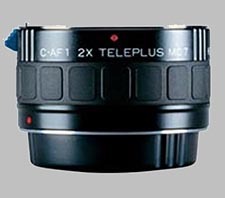 (From company literature) The Kenko Teleplus MC 7 AF DG Teleconverter has the effect of doubling the focal length of your lens. For example, using the MC 7 AF DG teleconverter with a 300 mm lens will effectively increase the focal length to 600 mm. It is an easy and inexpensive way to increase the abilities of your telephoto lens without the expense of purchasing and carrying another telephoto lens. Kenko Teleplus converters are small and easy to carry in your camera bag. KENKO Teleplus MC 7 AF DG converters are made with high quality multicoated optical glass supplied by Hoya Corporation, the world's largest manufacturer of optical glass. The MC 7 AF DG converter has genuine Gate Array IC (Integrated Circuit). This means that the converter's unique circuitry maintains signal integrity between the camera body and lens. These converters are designed to electronically operate the same way an original manufacturer's converter would. The DG version is optimized for use with digital SLR cameras, as well as film cameras. Full AF operation with Teleplus MC 7 AF DG is possible with camera lenses with open aperture of f/2.8 or brighter. Please be aware that AF will work properly only if there is enough light and contrast on the subject to activate the camera's AF sensors (manual focusing is recommended when using lenses with smaller open f-stop value than those given above). with well corrected lenses, in this way ver nice photos. By this converter you don't miss a 50 mm macro lens. very sharp close ups with it.